JERUSALEM (CNN) -- Prime Minister Ehud Olmert vowed Wednesday that Israel's air assault on Gaza would not end until Hamas militants quit firing rockets into Israeli territory. 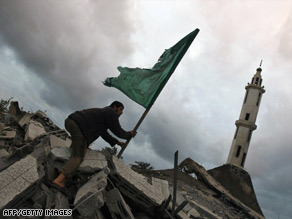 A man plants a Palestinian flag Wednesday in the rubble of a mosque in Gaza City. "We did not enter this operation in order to end it with the firing still continuing," Olmert said in a security cabinet meeting, according to a senior government official. "Hamas broke this cease-fire," Olmert said. "If the conditions ripen" and if there is a solution "that promises a better security ... we will consider it, but we are not there yet," he said, according to the official. Despite a French proposal for a humanitarian truce, Israel earlier Wednesday decided to continue the operation, saying Israelis must have a "real and sustainable solution," Olmert spokesman Mark Regev said. Israeli airstrikes have pounded the territory since Saturday in an effort to halt the firing of rockets into southern Israel. More than 390 Palestinians have been killed, according to Palestinian medical sources, and some 1,900 people have been wounded, including 400 women and children. Hamas Prime Minister Ismail Haniya, whose office in Gaza was struck overnight, said Israel needed to "stop attacking and killing our children, women and men." "The aggression must stop, the crossings must open and the blockade must be lifted and then we can talk about all other issues," he said in televised comments Wednesday. "Then we can start a national dialogue without any preset conditions." Israeli sources say four Israelis have been killed by Palestinian rocket fire. The Israeli air force carried out about 40 airstrikes Wednesday, and Palestinian militants fired about 70 rockets into Israel, the IDF said. More than 30 rockets landed in southern Israel on Wednesday, including at least four in Beer Sheva, Israeli police spokesman Mickey Rosenfeld said. Beer Sheva, about 25 miles away from Gaza, is the farthest that rockets from Gaza have ever landed inside Israel. "There's no fuel, there's no power plant, there's no electricity working now," she said. "Hundreds of families in the Gaza Strip are suffering, not only [from] the fear of airstrikes, but also the lack of electricity, lack of water, lack of food supplies," Saud Abu Ramadan, a freelance journalist who lives in Gaza City, told CNN's "American Morning." Exiled Hamas leader Khaled Mashaal is ready to stop the fighting in exchange for an end to Israel's blockade of Gaza, the Russian Foreign Ministry announced. Mashaal spoke with Russian Foreign Minister Sergei Lavrov on Wednesday and outlined Hamas' position on the resumption of the Palestinian reconciliation process, the foreign ministry said. "Mashaal said in response to [Lavrov] that they are ready to end the armed confrontation, but only if these measures are linked to steps intended to remove the Gaza Strip's blockade," the ministry said. Earlier Wednesday, the Israeli military warned neighbors of Hamas co-founder Mahmoud al-Zahar to leave because it may bomb the area, the neighbors told CNN. Al-Zahar was the Palestinian foreign minister under the Hamas-led government before it was dissolved by President Mahmoud Abbas after Hamas seized control of Gaza in 2007. Al-Zahar's son was killed in an Israeli airstrike in January 2008. The Israeli military says it is targeting only Hamas militants. But the U.N.'s AbuZayd said 20 to 25 percent of the casualties arriving in Gaza hospitals appear to be civilians, and she said the bombardment is not turning the people of the territory against Hamas. "Hamas is not the one being blamed. It's still Israel, America," she said.